Mount Agung erupted in the wake of a terrible impact. This volcano throws hot rocks with a temperature of 500 degrees celsius. The stone that flies from the top of a mountain is bigger than a human fist. The stones raised by Mount Agung resulted in rain stones. The stones fall in the village of Hamlet, District Kubu, Karangasem regency, Bali. Rain stones do not reach the safe zone, the hot stones just fall in the zone four kilometers from the summit crater of Mount Agung. Although the volcano in Bali has thrown rocks from the summit, it is not yet the peak of this mountain activity. This phenomenon is a phenomenon of tremor over scale with signs of throwing rock / rain rock around the peak. This has been explained by the Head of Volcano Mitigation Division of Volcanology and Geological Hazard Mitigation, Gunung Api Agung Observation Post in Rendang Village, Rendang District, Karangasem Regency, Bali, Tuesday 28 November 2017. Until now there is no lava lubrication from the top of the crater. Although the activity of this mountain has increased. It is even predicted that a volcanic eruption would be so dense and enormous, more dreadful than the eruption that had occurred in 1963. Based on the local authority, the eruption of Mount Agung is accompanied by an explosive eruption with a weak sound that sounded up to a distance of 12 km from the summit. The lava glow at the top of the mountain is increasingly observed at night from the beginning of the eruption. This indicates the potential for a larger eruption is imminent. Public Relations National Disaster Management Agency previously mentioned the greater potential of Mount Agung eruption. This potential is observed from the elevated status of Mount Agung from Alert to Alert. Negative and bad impacts due to Mount Agung erupted is the economy in Bali that can be weakened. Because now the airport has been closed until the time limit continues to be divaluated, depending on the status and circumstances of mountain leyusan. Flights to and from Bali have been closed. Many local and foreign tourists are trapped in I Gusti Ngurah Rai airport. 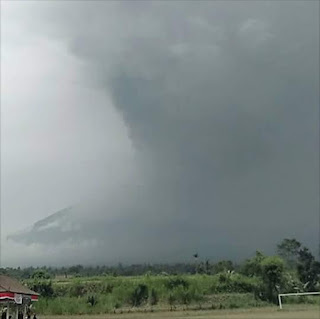 Many of them did not know that Mount Agung in Bali erupted.